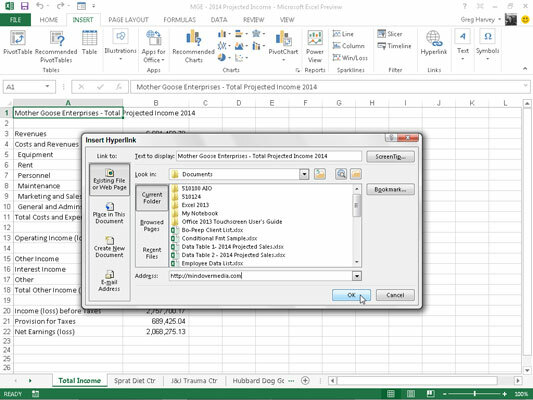 Hyperlinks automate Excel 2013 worksheets by making the opening of other Office documents and Excel workbooks and worksheets just a mouse click away. It doesn’t matter whether these documents are located on your hard drive, a server on your LAN (Local Area Network), or web pages on the Internet or a company’s intranet. You can also set up e-mail hyperlinks that automatically address messages to co-workers with whom you routinely correspond, and you can attach Excel workbooks or other types of Office files to these messages. When creating a text or graphic hyperlink, you can make a link to another Excel workbook or other type of Office file, a website address (using the URL address — you know, that monstrosity that begins with http://), a named location in the same workbook, or even a person’s e-mail address. The named location can be a cell reference or named cell range in a particular worksheet. Click the Hyperlink button on the Insert tab of the Ribbon or press Alt+NI, or simply press Ctrl+K. Excel opens the Insert Hyperlink dialog box in which you indicate the file, the web address (URL), or the named location in the workbook. To have the hyperlink open another document, a web page on a company’s intranet, or a website on the Internet, click the Existing File or web Page button if it isn’t already selected and then enter the file’s directory path or web page’s URL in the Address text box. If the document you want to link to is located on your hard drive or a hard drive that is mapped on your computer, click the Look In drop-down button, select the folder, and then select the file in the list box. If you’ve recently opened the document you want to link to, you can click the Recent Files button and then select it from the list box. If the document you want to link to is located on a website and you know its web address, you can type it into the Address text box. If you recently browsed the web page you want to link to, you can click the Browsed Pages button and then select the address of the page from the list box. To have the hyperlink move the cell pointer to another cell or cell range in the same workbook, click the Place in This Document button. Next, type the address of the cell or cell range in the Type the Cell Reference text box or select the desired sheet name or range name from the Or Select a Place in This Document list box. To open a new e-mail message addressed to a particular recipient, click the E-mail Address button and then enter the recipient’s e-mail address in the E-mail Address text box. If you want the hyperlink to add the subject of the e-mail message when it opens a new message in your e-mail program, enter this text in the Subject text box. If the recipient’s address is displayed in the Recently Used E-mail Addresses list box, you can enter it into the E-mail Address text box simply by clicking the address. (Optional) To change the hyperlink text that appears in the cell of the worksheet (underlined and in blue) or add text if the cell is blank, type the desired label in the Text to Display text box. (Optional) To add a ScreenTip to the hyperlink that appears when you position the mouse pointer over the hyperlink, click the ScreenTip button, type the text that you want to appear next to the mouse pointer in the ScreenTip box, and then click OK.
After you create a hyperlink, you can follow it to the site you associated with the hyperlink. To follow a hyperlink, position the mouse pointer or Touch Pointer over the blue text or graphic image. When the pointer changes to a hand, click the hypertext or graphic image, and Excel makes the jump to the external document, web page, cell within the workbook, or e-mail message. After you follow a hypertext link to its destination, the color of its text changes from the traditional blue to a dark shade of purple. This color change indicates that the hyperlink has been used. (Note, that graphic hyperlinks do not show any change in color after you follow them.) Additionally, Excel restores this underlined text to its original blue color the next time that you open the workbook file. If you need to edit a hyperlink attached to a worksheet cell or graphic object, you must be careful. When getting Excel into Edit mode so that you can change the text, you don’t inadvertently follow the link. When dealing with hypertext in a cell or assigned to a graphic object, you’re best off right-clicking the cell or image and then clicking the appropriate editing command on its shortcut menu.